All over the country, women are having babies later in life. Careers, desire for financial stability, and divorce and remarriage have all played a factor in this new profile of motherhood. There are some definite advantages to being midlife parents. Older men tend to be more involved fathers. The baby boomer fathers today may not remember having much affection or physical contact from their dads. They are changing this trend by being more involved with their children and being more committed to fatherhood. Older parents are more established in their careers. Once career issues are ironed out, children are less of a threat, and parents can devote more time to their families. This also allows for greater financial stability when raising children. It also means parents can probably afford quality child care. Midlife parents say they are more patient, calm, and better able to go with the flow than when they were younger. They've reached a new maturity level. They don't need children to fulfill their ambitions and prove they are good people. Their children are freer to be individuals and grow up with loving, supportive parents. 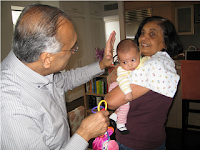 Older parents also make more time to spend with their children. They want to make the most of the wonderful gift they've been given. Where there's an up, there's a down, and there are some disadvantages to being an older parent. The most obvious is age. How will children feel about having older parents? How old will parents be when their children graduate from high school or college? Age can cause some isolation from other parents who are much younger. Older parents may have less energy, but parents today are very health conscious and that isn't as much of a drawback. The big question is how much energy will parents have to play something like soccer at age 50? Having a baby at any age is a big decision. Age shouldn't make a difference in how much a parent loves and cares for a child. Children love their parents, whatever their age.